Dudley and Karen have been a Pet Partners therapy team since 2014. Together, they have made a difference in the lives of countless individuals, young and old, from around the country. 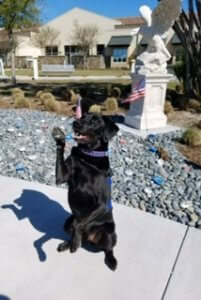 Prior to moving to Orlando, Fla., Dudley and Karen visited elementary schools in New Hampshire and participated in the Pet Partners Read With Me program, helping children experience the joys of reading at the library. Dudley loves meeting kids, almost as much as he loves snuggling up next to them while they read him a good book. Dudley also enjoys spending time with the senior community. A few notable locations the duo currently visit include Spring Hills Assisted Living, Hunter’s Creek Nursing and Rehab, Plantation Oaks Senior Living, and the VA at Lake Nona. From May through October, Dudley and Karen go to Maryland and make biweekly visits to senior care facilities. Dudley is always up for an adventure when it comes to his weekly visits! 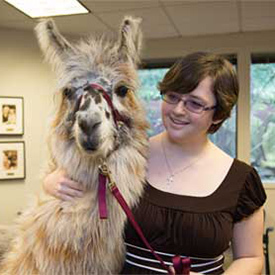 Karen’s fondest memory as a Pet Partners therapy team took place four years ago. 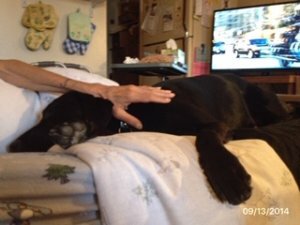 She and Dudley received a special request to visit a man on hospice, who was reaching the end of his life after a battle with stomach cancer. The man’s last wish was to spend time with a dog. Dudley laid on the man’s bed for about two hours, giving just as much love as he had received. Karen could see the comfort and joy his presence brought the man. It was a heartwarming experience she will never forget. 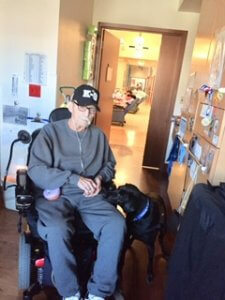 Karen looks forward to more touching moments with Dudley and the special individuals they meet, for years to come.